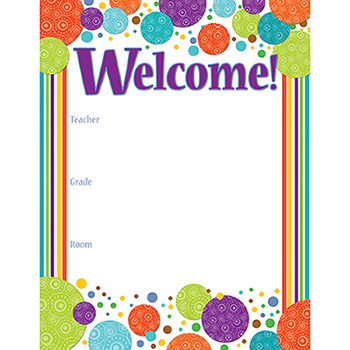 Create a welcoming, cheerful atmosphere for your classroom with this funky, contemporary Calypso Welcome chartlet. Easy to personalize, this chartlet is perfect for conferences, open houses, first day of school, science fairs, and more! Includes one chart measuring 17" x 22". Look for coordinating products in the this design to create an exciting designer classroom theme!